If you missed the Membership Drive, please contact Jenny Foshag, as soon as possible to join or renew your membership and get your glow lights. Any household within the PPNA borders, 60th to 68th from North to Lloyd, may hand out treats. 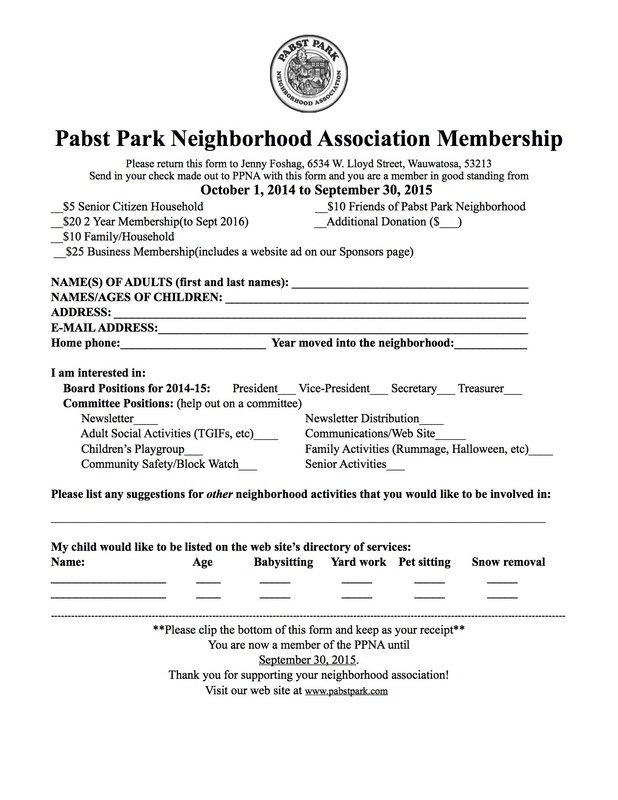 The Fall Newsletter with have the official PPNA Pumpkin to hang in your window to show your participation. This is a PPNA sponsored event, please support your neighborhood association by joining the PPNA or renewing your membership at this time. Glow Lights will be given out to participants at the membership drive. Two year members and those who have mailed in the membership form will have Glow Lights delivered to their home. NEW FOR THIS YEAR~There will be two PPNA sponsored CIDER STOPS. At our cider stops, we will be collecting nonperishable food items, toiletries or monetary donations for Tosa Cares. Visit www.tosacares.org for a list of preferred donation items. Have your little ghost or goblin give a little something back to the community for their basket of goodies! If there is a chill in the air, feel free to grab a warm cup of apple cider at either location. Cider Stops are 2119 North 61st and 2119 North 66th.